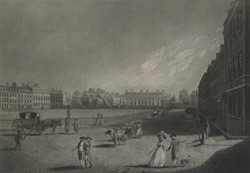 Engraver: Pollard, R. & Jukes, F.
View of Bloomsbury Square which at this time was a fashionable London suburb, popular with writers, painters and lawyers. It was laid out in the early 1660s, to the south of the house of the Earl of Southampton. It was originally intended to hold servants houses, stables and a market. However plots of land next to the square were sold off for building houses. The leases required houses of be built of a similar size and style which gave the square its planned appearance.